Polycystic kidney disease (PKD) is a genetic disorder. 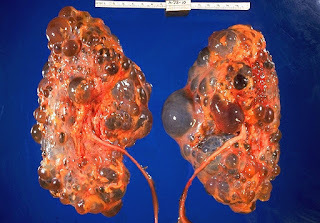 Multiple clear or brown fluid-filled cysts are formed in the kidney in PKD. The growth of these cysts leads to loss of normal kidney structure and functions and eventually causes kidney failure. Many other complications like hypertension and cysts formation in the liver may develop. The good news is that you can protect yourself from cancer by following a healthy lifestyle and avoiding some chemical substances (Carcinogens) that cause cancer. according to WHO 30 to 50% of all cases of cancers are preventable. Development of cancer in a person depends upon a combination of genetic makeup (genes) and his lifestyle. Genetic profile of a person is unchangeable but lifestyle can be modified so the exclusion of one risk factor in the form of lifestyle modification reduces the risk of developing cancer. For example, if a person has a family history of lung cancer he can reduce the risk of cancer by avoiding smoking. Phthisis bulbi is an end-stage eye disease characterized by soft, shrunken, disorganized and atrophic eye. It is the complication of other eye diseases. Reduced aqueous humor production in phthisis bulbi lower the intraocular pressure of eyeball. Definition it is a clinical condition in which a child receives non-accidental injuries once or more than one time by his parents or guardians. Usually, the age of the child is below 3 years. It is seen more in male than female. Other names of Battered child syndrome are caffey syndrome, Caffey-Kempe syndrome. Causes Lower socioeconomic backgroundLow level of education of caregiversFinancial problemsCaregivers suffering from stress because of work or family conditions.A child born with the unmarried couple is more likely to suffer from "Battered child syndrome".Unwanted child due to the failure of contraceptives.Drug abuse or alcoholism.Parents themselves were the victim of BCS.Triggering factors are frequent cry, which creates disturbance in activities of parents. disobedient behaviour, bed wetting. Electrocution is the very destructive form of injuries resulting from high voltage current passing through the body. The severity of electrical Injuries varies from a transient unpleasant sensation due to brief contact with low-intensity household current to instantaneous death and massive injury from high-voltage electrocution. Definition:- In 2-3 % cases of the autopsy, the cause of death remains unknown even after detailed laboratory examination these cases are termed as negative autopsy. In these cases, gross, histological, Microbiological, Toxicological and Virological examinations show no signs of abnormality and no adverse medical history is present. Causes of Negative Autopsy Death due to natural diseases like epilepsy, stroke, emotional stress, pathological processes, cardiac diseases.Due to Lack of histopathological and other investigation at autopsy site.Biochemical disturbances include uremia, hyperglycemia, hypokalemia, hypocalcemia, electrolyte imbalance as in potassium deficiency.Reflex vagal inhibition, incompatible blood transfusion, air embolism, allergic reactions including drug idiosyncrasy.The inexperienced doctor or lack of proper trainingInadequate history and information regarding the situation in which death occurred. Dying Declaration:- This is the verbal or written statement of the person who is dying as a result of the illegal act. This statement is related to cause and circumstances of impending death.